Here are a few representative examples of current pieces being offered for sale at Art Festivals and fine art/jewelry galleries throughout the country. Each piece is individually handcrafted, not cast, therefore no two are ever exactly alike. Much like when a basket is coiled, surface patterns are created on my pieces by wrapping fine gauge wire over a sterling silver armature layered with varying numbers of warp wires. The small images below are links to a new page featuring a larger, more detailed photo and description. Hand forged and fabricated. 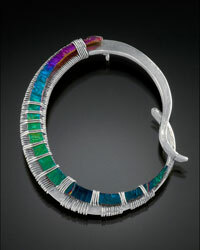 Fine silver, sterling silver, anodized niobium (can also be ordered in 14K Gold Filled and silver.) Comes with an 18” sterling silver chain. Hand forged and fabricated from heavy sterling silver rod. 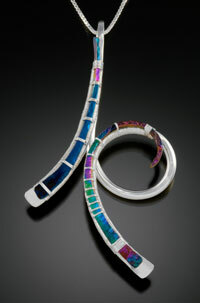 Fine silver, sterling silver, anodized niobium (can also be ordered in 14K Gold Filled and silver.) Comes with an 18” sterling silver chain. Hand forged and fabricated. Fine silver, sterling silver, anodized niobium (can also be ordered in 14K Gold Filled and silver.) Titanium coated quartz. 2.75" X .25" X .20"
2.5" X .80" X .20"
necklace 17" circumference X .4" earrings 1.5" X .25" X .15"
If you would like more information or to purchase any of the pieces on my gallery page please email: Orders@JeanettePayne.com. I welcome both Visa and MasterCard! Each of the items in and images of the Jazart Collection are copyrighted and may not be used or distributed for any purpose without prior written permission.